If you are moving to Monterrey or San Pedro, Santa Catarina, Pesqueria, Guadalupe or San Nicolas, and need an experienced and reliable international moving company in Monterrey providing: door to door high quality moving services, free quoting, English speaking, free in home inspections, expert Mexican customs clearance services without your being present at customs, having international moving company partners in The US and Canada then Moreno International is the answer. 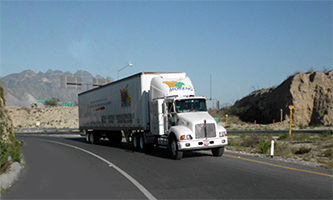 Long established for more than 35 years performing international moving in Monterrey, we guarantee quality services. Contact us and compare. We are most happy to serve you. What´s the price? How pay less? How choose an international moving company? What’s needed for customs clearance? Want to know? If you do then keep reading, and save money. Receive friendly and experienced personal attention in English, no answering machines wasting your time. We provide expert information on Mexican customs clearance, because if you don´t your shipment will be detained at customs, losing what you paid for the move and even risking confiscation and extra expenses. At Moreno International we guide you step by step from beginning to end, and if any problem happens we are here in Monterrey to help solve it, and this is a big advantage from booking your move in another country. Don´t be misguided by low quotes that turn out to be very expensive. Don´t wait contact us! We´ll be most happy to serve you. Click on Quote Now blue square right beneath photo carrousel and then on International Move square. Fill in blanks with requested information and after choose either Quick Calculator or Itemized Calculator. If you are planning to ship more than 15 items we recommend the Quick one. Once we receive this information we´ll email you a ball park estimate for your move, and if you consider it within your budget we recommend one of surveyors visiting your home for a more reliable price. Plan your move ahead of time is our best international moving to Monterrey advice. Decide what items you want to ship, sell, give away, etc. A good selection will help decrease the price of your move. Do not include in your move items prohibited by Mexican customs like foods, beverages, medicines, new items, etc. We´ll let you know if you are in doubt. Avoid stressful situations, delays, extra charges or the confiscation of your shipment. On moving day place under lock and key passports, cash, jewelry, school documents, etc. to avoid being packed and shipped with your goods, having to wait until delivery time to recover them. Ask Moreno International before moving day what documents you need for mexican customs clearance, about prohibited items, free price estimate, free in home inspections and book packing and pick up dates. Plan your move ahead of time is our best international moving to Mexico advice. Documents required for returning Mexican nationals and citizens from other countries are different. Mexican consulate legalized inventory “CERTIFICADO A LA LISTA DE MENAJE DE CASA PARA MEXICANOS”. This document is strictly necessary, wothout it would be imposible to import his/her household goods. It is obtained by showing proof to embassy or consulate of having lived outside of Mexico for six continuous months, and a list of the household goods being imported. You can include tax free, used for more than six months, furniture and household goods for the exclusive use of one family. There has to be evidence of being used, like clothing, furniture, books, ornamental items, etc. It is not allowed to include in your shipment new items or used ones with less than six months of use, items in original packing, live plants or animals, food and beverages of any type including water, firearms, ammunition, explosives, medicines, narcotics, counterfeit items, automobiles, motorcycles, motor boats or golf carts run by gasoline, cash, jewelry, machinery or items to set up shop or factory. If any question, please ask Moreno. Nationals with citizenship other than Mexican with temporary visas can import them temprarily by obtaining the corresponding permit. To do it requires being present at the port of entry and doing all paperwork themselves. Once this permit is obtained vehicle has to be driven inside Mexico by visa holder himself. Only one automobile is allowed per visa holder and permit duration usually is for the length of the visa. If any questions, please contact us. Because requirements vary from country to country it is imposible to list them all here, so please ask us and we will be happy to assist you. Probability of full loss is very low, but the possibility is always there, so it is recommended to insure all your goods before packing starts. To be fully protected all goods in shipment must be insured for how much it would cost to replace items in your country of destination. If shipment were partially insured or undervalued you will only be reimbursed proportionally for any loss or damage. You are about to live in a modern city full of passionate, hard working people. World class hospitals such as Doctors Hospital (biggest hospital in Latin America), Hospital San José, Christus Muguerza. Churches of all denominations: Catholic, Protestant, Jewish, Buddhist, etc. You´ll definitely find your favorite food and restaurants in Monterrey. There are great local restaurants like El Granero, El Mirador, El Gaucho, the famous Pollo Loco, or El Muelle de al Lado with its delicious shrimp tacos and globally known franchises like McDonald's, Applebees or Pizza Hut; and restaurants from all over the world and for every palate. When it comes to exercise and sports in Monterrey, you can always go jogging at Paseo Duendes, Calzada del Valle or go biking at Rufino Tamayo park. You would also love to walk uphill through the"veredas" at Chipinque, surrounded by beautiful trees, with the occasional squirrel passing by. There is a great golfing course at Valle Alto, several modern gyms like Sport City, and sports clubs like Casino del Valle. Sports fans, remember Monterrey is home to professional soccer teams Tigres and Rayados, plus professional baseball team Sultanes. Bioparque Estrella, Paseo Santa Lucía, Macroplaza, Grutas de García, Arena Monterrey. H-E-B, Wal-Mart, Price Costco, Office Depot, Home Depot, Plaza Fiesta San Agustín, Valle Oriente, Sears, Zara, Liverpool. El Granero, El Muelle de al Lado, Kampai, Pollo Loco, McDonald's, Subway, Pizza Hut, Little Caesar's, Starbucks Coffee, Chili's, Applebee's, Oriental Wok, Sushi Itto. Hospital San José, Hospital Santa Engracia, Christus Muguerza, Doctor's Hospital. Rufino Tamayo Park, Huasteca, Paseo Duendes, Sport City, Club Campestre, Casino del Valle, Alpino Chipinque, Tigres, Rayados, Sultanes. An industrial, modern city, Monterrey has a population over 4 million people, and is located in Northeastern Mexico, just 200 km south of the U.S. border. Its metropolitan area is integrated by municipalities of Apodaca, Escobedo, Guadalupe, Santa Catarina, San Nicolás de los Garza, and San Pedro Garza García. It has important connections with cities like Saltillo, Nuevo Laredo, and Reynosa, plus direct flights to cities like Dallas,Houston, New York City, San Antonio, Atlanta, Las Vegas and many others. Monterrey climate is semi-arid with very hot weather in summer reaching 104 ° F (40 ° C) or more for three consecutive months, being one of the warmest major cities in Mexico. Monterrey is an industrial city that welcomes everyday businessmen from all over the world. It is corporate headquarters to many important international companies among them KIA motors, FEMSA, CEMEX, Grupo Alfa, or Cerveceria Cuauhtemoc. Always remember to think about the distance to your workplace or your kid's school when looking for a house in Monterrey. There are internationally recognized schools in Monterrey such as the American School Foundation, Colegio Inglés, Colegio San Roberto, or the Irish Institute, which are bilingual (English, Spanish) among many others. There are also very important colleges and universities. Instituto Tecnologico de Monterrey which is considered among the best universities in Mexico and Latin America, la Universidad de Monterrey, and many others. Moreno International is proud to provide high quality door to door moving services in Monterrey, free quoting, qualified English speaking personnel, free in home inspections, expert Mexican customs clearance services without your being present at customs. Long established for more than 35 years Moreno International is the answer to your moving needs when international moving Monterrey. Contact us and compare. We are most happy to serve you.